Aura (Lena Dunham), a twenty-two year old film graduate and one-hit-wonder YouTube vlogger, returns home on a temporary basis to overcome her irresolution and re-position herself for her next crack at notoriety. As she settles back in with old friends and finds herself in soulless employment as a hostess at a local restaurant, Aura struggles to cope with the hardships of everyday life, her lack of creativity and her overwhelming self-deprecation. 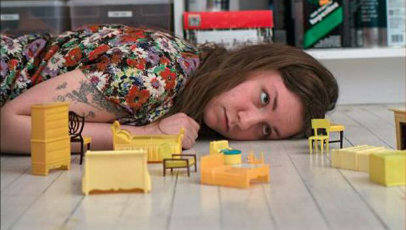 What’s key to Tiny Furniture, what makes such a standout piece of filmmaking, is found in how it taps into familiar, culturally appropriate territory – particularly with regard to how the internet is affecting the youth of today and their attitudes in general – in more ways than meet the eye. Through her continued, yet not entirely successful attempts to become a YouTube phenomenon, Aura is forced to come to terms with life, realising it’s not as simple to navigate as she suspected. It’s a neat tactic for someone of Dunham’s knowledge to attempt and, while it works in its unyielding ability to attune the audience to Aura’s early midlife crisis, it’s all built upon a screenplay – penned by Dunham herself – that focuses too intently on forced interactions and amateurish exploits and not enough on the debauchery typically associated with people in similar situations. Dunham’s unworldliness as a writer is key to Tiny Furniture’s failure to truly capture the uneasiness most post-university students feel. That’s not to say there aren’t successful comedy elements contained within the existential, mockumentary-style, largely autobiographical proceedings, because there are. And, while these moments of may not be the hearty, roll-around-the-floor moments, that’s not what Dunham is about, and the small, tightly contained bursts of wit that trickle out over the course of the film feel authentic to both how Aura thinks and Dunham’s intrinsic comedic charms. These brief interludes may not be enough to conserve an audience’s attention for the entire duration like Dunham expects, and more time should have been spent on awarding the main narrative with an overriding sense of purpose – something it noticeably lacks – but the loss of direction cleverly mirrors Aura’s current state of existence. Whether or not that was Dunham’s ambition is untold, but it’s certainly an interpretation that, with the aid of the entire cast’s devastatingly accurate performances – Dunham and Jemima Kirk as Aura’s highly strong British friend Charlotte, in particular – compensates for some of the screenplay’s shortcomings. As a director, however, Dunham excels. Made on a paltry budget and shot on less-than-professional hardware, Tiny Furniture boasts excellent, real-worldly cinematography and limited, pondering editing. Through Dunham’s spot-on, methodical compositions, each and every interaction between characters (and there’s a lot of them), each sly glance and body movement represent the varying characters’ personalities and attitudes more than dialogue ever could. Her competency as a writer may need some work, but there’s no denying that, when appreciated as a unsentimental portrait of our youth, Tiny Furniture is the work of someone destined for the big time.